Hosted by Beijing Jiaotong University, Cooperated with World Conference on Transport Research Society (WCTR), sponsored by the Key Research Project of National Social Science Fund (17ZDA084). 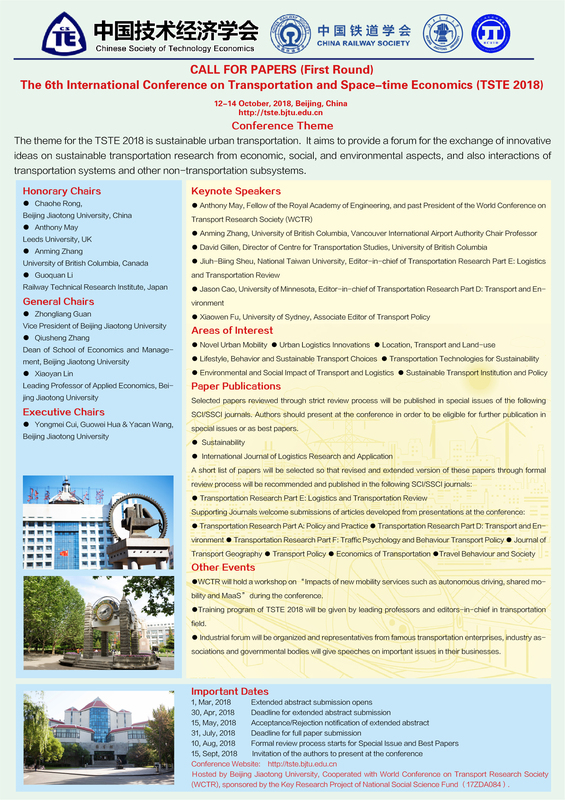 The theme for the TSTE 2018 is sustainable urban transportation. It aims to provide a forum for the exchange of innovative ideas on sustainable transportation research from economic, social, and environmental aspects, and also interactions of transportation systems and other non-transportation subsystems. The scope includes the development of sustainable transportation systems; the integration of social science, modern logistics, and technology innovation including but not limited to ICT with transportation; the problems of and solutions to sustainable passenger and freight transportation; the effectiveness and efficiency of transportation systems; the environmental and social impacts of transportation systems; the ideas and suggestions for transportation policy, and the planning practices of sustainable transportation; the comparisons of transportation systems from a global perspective, and etc. ● WCTR Special Interest Group SIG G2 “National and Regional Transport Planning and Policy” will hold a workshop “Impacts of new mobility services from the viewpoint of Local Communities and Regions”. Call for paper posted at http://e242.zserv.tuwien.ac.at/fileadmin/mediapool-verkehrsplanung/Diverse/Links/CfP_WCTR_SIG2_mid-term_event_final_v1.pdf. ● Training program of TSTE 2018 will be given by leading professors and editors-in-chief in transportation field. ● Industrial forum will be organized and representatives from famous transportation enterprises, industry associations and governmental bodies will give speeches on important strategic and operational issues in their businesses. Novel Urban Mobility- ● Autonomous driving ● Shared mobility (e.g. sharing bicycles, car sharing; ride pooling, shared commuting, park sharing/renting, boat sharing) ● MaaS (Mobility as a Service) ● EVs, hybrid, hydrogen vehicles mobility ● Other new forms of mobility.Urban Logistics Innovations- ● Infrastructures (such as urban consolidation centers, loading and unloading zones etc.) ● Regulations and governance (such as low emission zones, subsidies and allowances for night deliveries, congestion charge etc.) ● Technology (for example,intelligent transport systems, big data analysis) ● Management (such as collaborative freight delivery, crowd-sourced deliveries). Location, Transport and Land-use- ● Urban and transport planning ● Location and individual accessibility ● Space-time theory and technology ● Transport oriented development (TOD) ● Land use and high-speed rail ● Transportation and land use systems in growing and shrinking cities. Lifestyle, Behavior and Sustainable Transport Choices-● Car ownership and travel behavior ● Low carbon mobility (LCM) policy and behavior change ● Healthy urban transport policy and behavior change ● Land use policies and behavior change ● Social network and transport choice ● Latent factors and transport choice ● Residential & workplace location and transport choice ● Consumption & leisure pattern and transport choice. Transportation Technologies for Sustainability - ● ITS user services ● Driver and traveler support systems ● Data management systems ● Electronic payment systems ● Security systems ● Cooperative techniques and systems ● Key developments in intelligent vehicle technology Environmental and Social Impact of Transport and Logistics- ● Mobility, energy and climate change ● Measures for impact assessment ● Equity and exclusion in transport ● Property, housing, employment and health impacts ● Connectivity of rural communities. 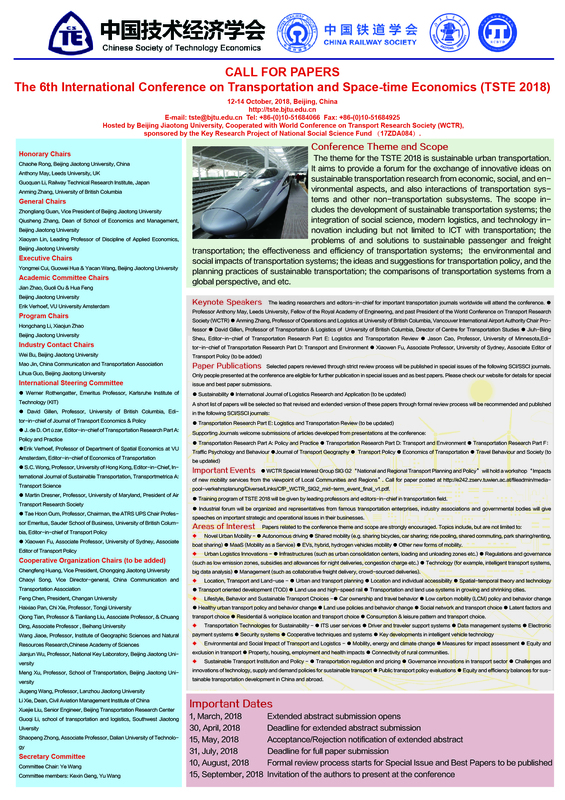 Sustainable Transport Institution and Policy- ● Transportation regulation and pricing ● Governance innovations in transport sector ● Challenges and innovations of technology, supply and demand policies for sustainable transport ● Public transport policy evaluations ● Equity and efficiency balances for sustainable transportation development in China and abroad.